What do I want for Christmas? 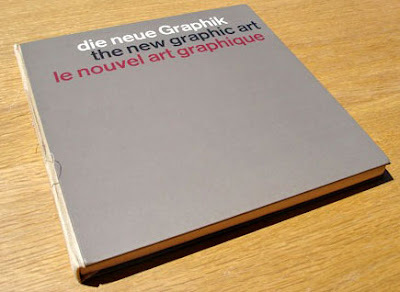 I am on the lookout for a good copy of 'Die Neue Graphik' (1959), a history of Modernism in design up to the late 1950's, written by Karl Gerstner, a pioneering typographer and leading exponent of the 'Swiss Style'. I saw the book once in Compendium, a now-defunct but legendary London bookshop in Camden, but I was probably more interested in Beat Poetry at the time and never bought it (although I should mention that it was priced at about £150!). Swiss Style, or more correctly the 'International Typographic Style', was a hugely important graphic design style developed in Switzerland in the 1950's. It emphasised legibility and objectivity and utilised bold sans serif type, grid system layouts and ragged, left-justified text. Swiss style commercialised the modernist ideas and experiments of Bauhaus and the Constructivists, and opened up experimental type to mainstream publishers. It built upon the ideas of the New Typography a decade or so before, especially the work of Jan Tschichold, who abandoned the use of all serif typefaces. And it gave us the Neu Haas Grotesk typeface, which we know and love as Helvetica. 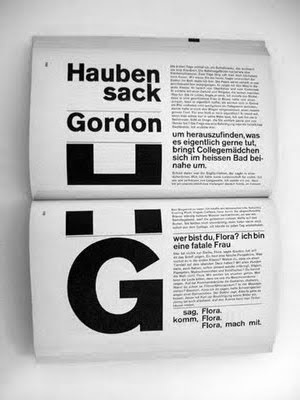 Gerstner was originally an artist, but soon realised the potential of graphic design, and developed a unique typographical style. Believing that center-justified text was untidy and formless, he preferred to work to a system of grids. He created unjustified, ranged-left setting for text, and this allowed the message and its form to become inseparable and interdependent – idea, text and typographical presentation became one. 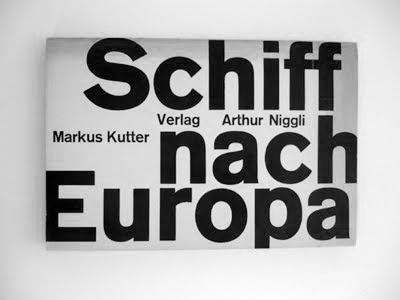 One of Gerstner's first pieces was a book design for a novel by his friend and business partner, Markus Kutter, 'Schiff Nach Europa' (Ship to Europe). This book is laid out in a grid system to emphasise the author's experimental use of type, which included unusual mixes of font sizings, and different styles of discourse (eg newspapers, advertising copy, film script, monologue). Gerstner's design agency, GGK, turned marketing and advertising companies on to the possibilities of the Swiss style. He designed the corporate identities for such companies as Swissair, Shell, Burda and Langenscheidt and worked as a world-wide identity consultant and designer for IBM. Eventually he abandoned design and went back to art, but not before he had shaped the future of visual communication and inspired the likes of Wolfgang Weingart, Reid Miles and Neville Brody. Schiff Nach Europa - Karl Gerstner/Markus Kutter. i - the Saviour of the Newspaper?